"Are you an aspiring musical artist looking to increase your bandwidth with listening audiences? Whatever you do, don’t fall into the trap of thinking that you need to do all the work yourself to be an “authentic” solo artist. Even Shakespeare regularly collaborated with others! Thinking like an entrepreneur means realizing that when you combine your talents with those of an artist or musical act who are perhaps more established, you’ll expedite your own songwriting, music production, and promotional success. So, what are you waiting for? 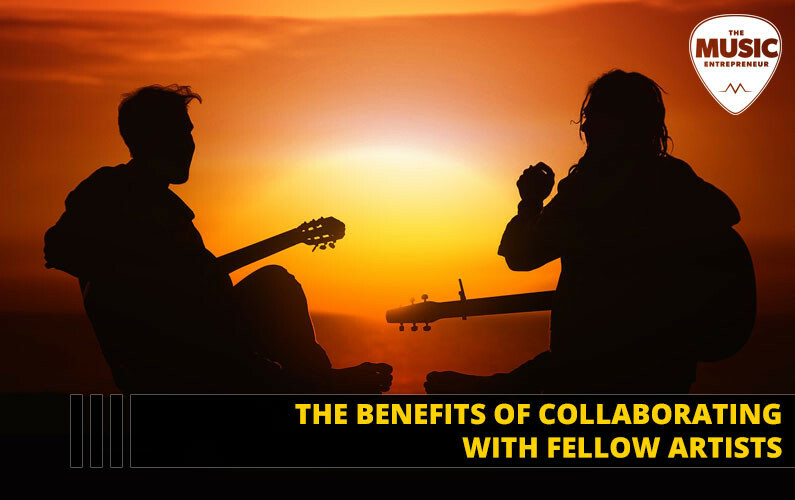 We’ve listed seven key advantages of collaborating with your fellow musicians below. When you work together in the promotion process, you double the social media profile of the song or album that you’re working on. That means double the follower reach, and hopefully double the commercial success of your tracks. This will work for both online and traditional media. While you monitor the likes and shares of your social media posts, why not go old-fashioned too? Put up posters with your artist names clearly printed and distribute flyers on the street – people love double-act gigs! It’s a simple equation: the more headliners for any given musical event, the more audiences are brought in, and the bigger venues you’ll be able to play in. Basically, if you’ve managed to secure a collaboration with a big artist, then you’re primed to tap into their fan base. When you pool your funds with other artists, you’ll be able to gain access to larger venues that can be better outfitted with performance gear such as amps, sound systems, stage lighting and graphics. This means your audience will get to hear your music in the best possible sound quality, as opposed to sitting in a claustrophobic bar with bad acoustics. You can gain lifelong friends and incredible memories by collaborating with your fellow artists, as well as the chance to meet their friends, mentors, and influencers. If your collaborator is further along in their musical journey, you will be able to gain priceless advice from them, as well as new connections to producers, agents, gig promoters, and music bloggers – exactly the people you want to be casually introduced to after a gig. Collaborating can be an unbeatable way to widen your industry network, express your willingness to learn from people with more experience than you, and in turn help and befriend other artists. One successful gig and its subsequent introductions may open the door for invitations to future gigs with even more experienced artists to co-create with. You love creating music – that’s the reason you wanted to become a musician in the first place! The great news is that collaborating with other artists can do wonders for your own creativity. If you’ve been struggling with writer’s block or need a great harmony from another instrument, an exhilarating conversation with another musically-oriented mind with a different point of view may set up a great jam session and get your best lyrics flowing again. Artists sometimes don’t notice when they’re in a rut. The most important lesson a musician can learn is to keep learning and evolving, because if you’re not constantly honing your craft and expanding your reach, you can’t expect your music to improve. That’s where your colleagues in the industry come in. Know of an artist who’s mastered those tricky drum patterns you just can’t get the hang of yourself? Always wondered what software a particular DJ uses to make their mixes? Ask them if they’d be keen to collaborate with you. The best thing about these types of collaborations is that when you both bring something entirely new and different to the table, you can create some truly idiosyncratic beats. +Get Other People To Do The Dirty Work For You! Collaborations lead to tangible rewards – big-break opportunities, such as headlining on a global tour or being credited in a chart-topping tune. However, collaborating with other artists is also invaluable for the human connections you’ll make. As a musician, you’ll find your soulmates and friends in other people who are pursuing the same goals. No matter where they happen to be on their artistic trajectory, there’s guaranteed to be massive common ground between you. You may just find a lifelong friend as well as a close collaborator. By collaborating with fellow artists at the beginning of your own career, you’ll realize just how important the value of artistic generosity is to the survival of the industry at large. Better-known artists will pair up with lesser-known musicians to boost the latter’s chances in a cut-throat industry and also to nurture the new talent and sounds, which are vital to the industry’s future. And plus, information about newcomers can spread incredibly quickly within the industry, so it’s best to build up your reputation as a generous and professional collaborator now instead of waiting for later to put in the legwork.